From the banks of the Nile to the shores of the Mediterranean, it is in the land of Egypt where medicine probably started. This is the story of a great period in the history of medicine. But let us start at the beginning. Imhotep, who flourished about 5,000 years ago, is the first person whose name is recorded not for being a king or a conqueror, but for the way he contributed to knowledge1. He was a statesman: he advised Pharaoh Zoser. He was an engineer: he built the stepped pyramid of Saqqara, precursor to the many great pyramids to come. But above all he was a physician of talent, who launched the first true medical revolution: that disease was not something to be dealt with by magic, but by science: observation, diagnosis, and treatment. Egyptians would later deify him as the god of medicine. 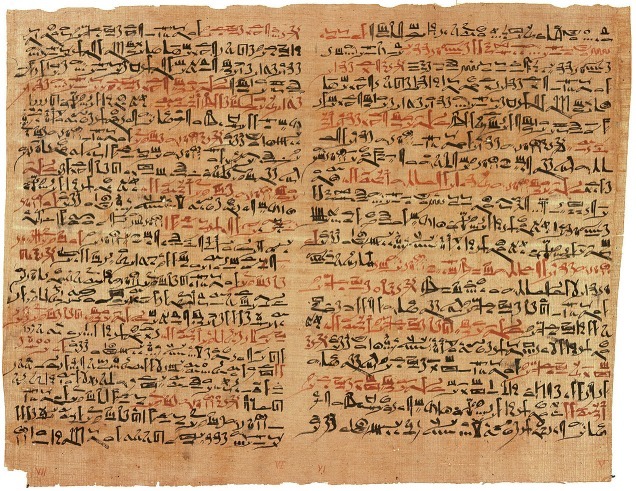 The great tradition of ancient Egyptian medicine was maintained for millennia. The Edwin Smith papyrus and the Ebers papyrus both speak of exquisite knowledge and understanding. 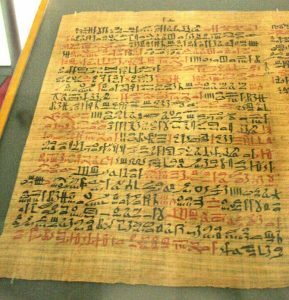 The Edwin Smith papyrus is the earliest known medical document, written around 1600 BCE, but is thought to be based on material from as early as 3000 BCE. It is an ancient textbook on trauma surgery. It mentions trepanation. It describes anatomical observations and the examination, diagnosis, treatment, and prognosis of numerous injuries in exquisite detail. It gives the first descriptions of the cranial sutures, the meninges, the external surface of the brain, the cerebrospinal fluid, and the intracranial pulsations (Figure 1). Other documents, like the Ebers Papyrus, give details showing an in-depth understanding of how the body works. It defines the heart as the center of the blood supply, with vessels attached for every member of the body. Mental disorders such as depression and dementia are covered, and the descriptions suggest that mental and physical diseases were considered in the same way. The document also has chapters on contraception, diagnosis of pregnancy and other gynecological matters, intestinal disease and parasites, eye and skin problems, and the surgical treatment of abscesses and tumors, bone-setting and burns. Dentistry is also covered, and we have evidence of false teeth existing in Egypt some 4,000 years ago (Figure 2). In a number of ways, this ancient Egyptian knowledge was superior to the later Greek knowledge that would flourish in the first millennium BCE. But civilizations wax and wane, and Egypt was in a slow decline. It was finally conquered by the Persians in 525 BCE, while Greek civilization, already well-established from the time of the Minoan and Mycenaean Civilizations, would take over the torch of knowledge and enter a golden period whose achievements continue to dazzle the world to this day. The Greeks erected a philosophical, artistic and scientific culture that was to rival the best that the world has seen before or since. Medicine would be an important part of this edifice of knowledge, as it was in the age of Pericles, largely through the work of Hippocrates of Cos (c. 460 BCE–c. 370 BCE) that medicine was recognized as an independent field of science, separate from either magic or the other sciences. It was a profession which women were originally forbidden from practicing2. As usually happens with pivotal figures in history, Hippocrates would be a summation of the best of what preceded him, a major contributor himself, and the founder of a school of disciples who followed his teachings. His contributions are many, but he is most famous for the Hippocratic Oath3 still in use in many parts of the western world. Like Imhotep before him, Hippocrates believed that diseases were caused naturally, not because of superstition and gods, arguing that disease was not a punishment inflicted by the gods but rather the product of environmental factors, diet, and living habits. Indeed in the entirety of the Hippocratic Corpus there is not a single mention of an illness or a cure due to mystical factors. However, Hippocrates did work with many convictions that were based on what is now known to be incorrect knowledge of anatomy and physiology, such as his theory of Humors4. But Rome would soon rule the world, and Roman medicine reaches its apex with Galen (CE 129–216)5, on whom we will have more to say later. But between the decline of splendid Greece and the rise of mighty Rome, there is a glorious period, where in the ancient land of Egypt Alexander the Great would found a new capital of learning and knowledge on the shores of the Mediterranean: Hellenistic Alexandria. To the ancient land of Egypt, 2300 years ago, Alexander the Great, Aristotle’s pupil, brought his dream of culture and conquest, of uniting the world and launching a new era. 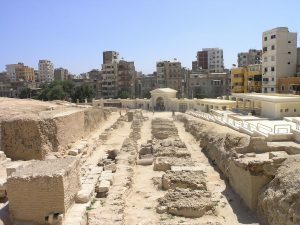 Alexander selected the site for a new capital: Alexandria. His successors in Egypt, the Ptolemies, built Alexandria, and made it the intellectual capital of the world. Its lighthouse, the Pharos, was considered one of the seven wonders of the ancient world. 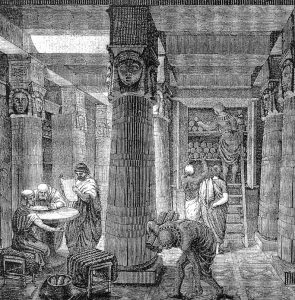 But a greater legacy was the Ancient Library of Alexandria. Launched in 288 BCE by Ptolemy I (Soter) under the guidance of Demetrius of Phaleron, the Mouseion, or temple to the muses, was part academy, and part research center, in addition to the great ancient library. The great thinkers of the age, scientists, mathematicians, poets from all cultures came to study and exchange ideas. Greek was reinforced as the language of science and knowledge in that period. • Manetho chronicled the pharaohs and organized Egyptian history into the dynasties we use to this day. They and many others were all members of that amazing community of scholars, which mapped the heavens, organized the calendar, established the foundations of science and pushed the boundaries of our knowledge as they unleashed the human mind on myriad quests. They opened up the cultures of the world, established a true dialogue of civilizations, promoted rationality, tolerance and understanding and organized universal knowledge. For over six centuries the ancient Library of Alexandria epitomized the zenith of learning. To this day it symbolizes the noblest aspirations of the human mind, global ecumenism, and the greatest achievements of the intellect. The library completely disappeared over sixteen hundred years ago, but it continues to inspire scientists and scholars everywhere (Figure 3). A famous medical school was established in old Alexandria during the third century BCE. Although mainly Greek in essence, and following the Hippocratic teachings, it was heavily affected by the medical practices of ancient Egypt. Anatomy was particularly advanced due to the possibility of dissecting the human body. The most important Alexandrian physicians were Herophilus and Erasistratus. Many graduates of this medical school traveled and practiced throughout the Mediterranean basin. 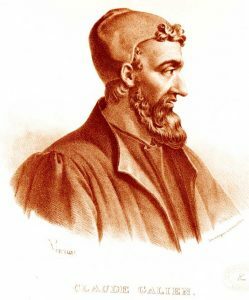 Galen, the famous Roman physician studied in Alexandria before practicing in Rome. His teachings and writings survived well into the sixteenth century and formed the basis of more modern medical practices during the Renaissance. These writings were conserved partly by Christian monks and partly by Arab and Jewish scholars of the middle ages. 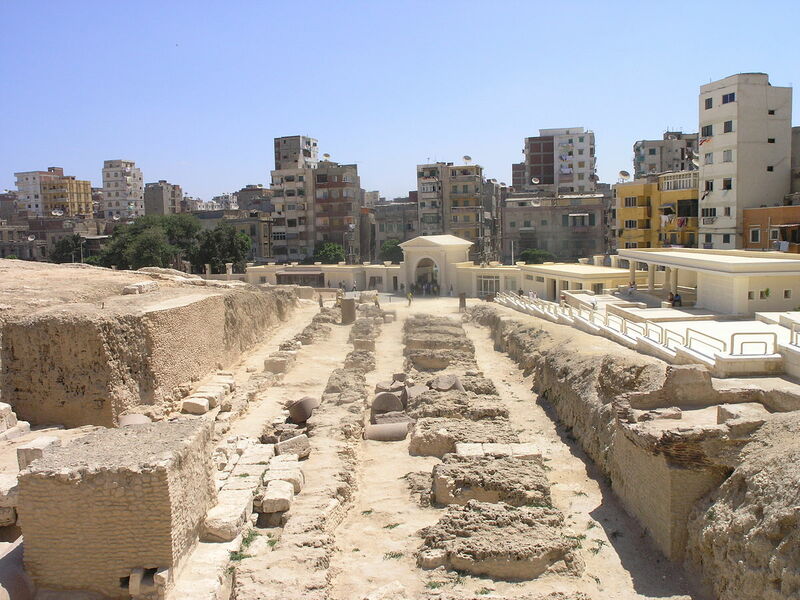 The medical school of Alexandria was still active until late in the 3rd century CE. However, it slipped slowly into oblivion after the fire of 391 CE, which also devastated the last remnants of its famous library. Unfortunately, almost no work of Alexandrian medicine survived intact; thus the production of the Alexandrian doctors is largely lost in the gap between two great bodies of ancient medical writings: the Hippocratic Corpus and the writings of the Imperial period, particularly those of Galen. But Alexandria was the bridge between these two worlds, and Galen, was the last of the great medical specialists to have drunk from the Pierian Spring of Alexandria6. The best of that school’s writings would be incorporated into his work, and it was his work that would represent the summation of the medicine of antiquity. 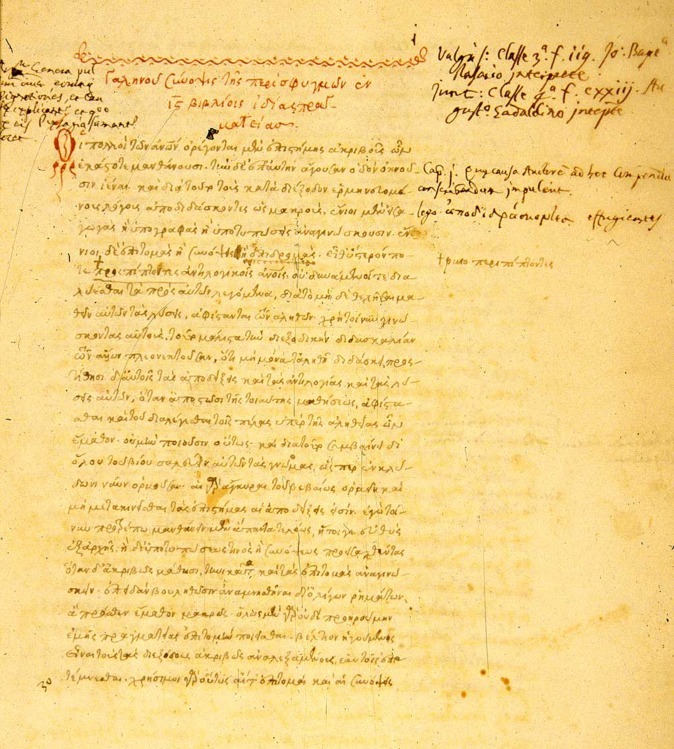 Most of the Hellenistic writings were written by historians of medicine; they wrote both medical textbooks and commentaries on the Hippocratic Corpus, which was already lost by the time of Galen, whose voluminous writings and many interests and references remain one of the principle sources for understanding the importance of what was produced in Alexandria in the four centuries that preceded him. 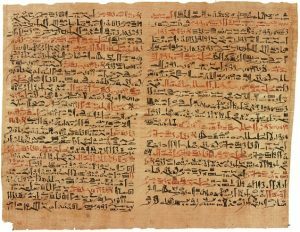 The earliest figures in the history of the Alexandrian medicine were Philitas of Cos (b. 340 BCE), and Praxagoras of Cos (second half of the fourth century BCE) who was the teacher of the famous Herophilus and was an anatomist. He also provided a study of the diagnostic value of the pulse and the nature of its origin in the blood vascular system. Aristotle’s famous writings on anatomy found particular resonance in Ptolemaic Alexandria, where Herophilus of Chalcedon (c. 330–260 BCE) and Erasistratus of Iulis on Ceos (about 315–240 BCE) made extraordinary progress in anatomy and physiology. They were to found two important schools of medicine in the heyday of ancient Alexandria. Herophilus, who was one of the greatest figures in Alexandrian medicine and who established his own school of medicine, was a pioneer of functional physiology, and produced a very large amount of anatomical writings. He correctly identified that it is the brain that is the controlling organ of the body, and not the heart as Aristotle had said. He carried out pioneering work on the anatomy of the brain and nervous system, and is credited with the identification of the dura mater and pia mater, two of the brain’s membranes; and with tracing the connections between the spinal cord, nerves, and the brain. Herophilus also studied the anatomy of eyes, neural anatomy, and the male and female reproductive system. He also distinguished between veins and arteries. In addition, He did a lot of work in functional physiology, and named parts of the human body such as the duodenum. Erasistratus of Iulis on Ceos (about 315-240 BCE), initially a collaborator of Herophilus, argued that the body is composed of threefold web; elemental nerve, veins, and arteries. In his account of the heart and its function, he distinguished between pulmonary and systemic circulation. He said that veins distribute blood through the body, and that air enters the body and then is drawn by the lungs into the heart, where it is transformed into vital spirit, and is then pumped by the arteries throughout the body. He also placed great emphasis on the study of the pulse, and on the concept of body temperature. Beyond these two giants, Herophilus and Erasistratus, there were many other eminent physicians in Alexandria, who by their collective work made Alexandria the major center of learning in medicine in the ancient world for about four centuries, until c. 162 CE, when Galen went to Rome and flourished there. The School of Alexandrian Medicine boasted many other luminaries, such as Apollodorus of Alexandria (3rd century BCE), a physician whose works on botany, pharmacology and toxicology were renowned; as well as Callimachus of Bithynia (later 3rd century BCE) a physician who belonged to the Herophilian school. Callimachus was also interested in pharmacology and wrote important commentaries on works of the Hippocratic corpus. Other luminaries included Hegetor (2nd cent BCE), an Alexandrian Herophilian physician, who was interested in pulse theory, and who treated the dislocation of the thigh bones on the basis of anatomical studies, rather than the empirical school’s analogies. Chrysermus (fl. mid-1st cent. BCE), was another Alexandrian Herophilian physician, who developed a theory of pulse that differed from that of Herophilus and Erasistratus. But not all the Alexandrian physicians were disciples of Herophilus or Erasistratus. There was an important empiricist school, with such luminaries as Serapion (or Sarapion) of Alexandria (fl. late-3rd cent. BCE) who established the Empiricist school or was its second head after Philinus of Cos, and Apollonius of Citium (c. 90–15 BCE), who advanced orthopedic surgery depending on Hippocratic texts, on which he wrote commentaries. Apollonius also wrote a substantial critique of fellow empiricist physician and surgeon Heraclides of Tarentum (fl. 85–65 BCE) who in addition to his Commentaries on Hippocrates, wrote four books on external and internal therapy, as well as a dietetic treatise, and some works in pharmacology. Of the works of Heraclides approximately 90 fragment and testimonia survive. Sostratus (who probably practiced in Alexandria after 30 BCE) was Alexandrian zoologist and surgeon, whose medical practices were chiefly in gynecology. Zopyrus of Alexandria (about the beginning of 1st cent. BCE) another surgeon, who invented an antidote for poisons and asked Mithridates, King of Pontus, to allow him to test it on criminals. Alexandrian science, though much diminished, continued to exist even as Rome eclipsed it, and among the later physicians of note, we can mention Didymus of Alexandria (fl. in the 4th or 5th century) who was both physician and agriculturist, who is said to have produced an important medical treatise in eight books and an agricultural treatise in fifteen books, the latter being supposed to be one of the sources of the Byzantine work “Geoponica”. But the transition from Alexandria to Rome, which was to be completed by the career of Galen as imperial physician and great writer, was already presaged in the emergence of Pedanius Dioscorides (c. 40—90 CE), who was a Greek physician, pharmacologist and botanist, who practiced in Rome at the time of Nero, and produced the most important pharmacopeia of all of antiquity – De Materia Medica – a 5-volume encyclopedia about herbal medicine and related medicinal substances that was widely read for more than 1,500 years and which existed in Greek, Latin and Arabic, throughout the middle ages. It remains the most important reference for our understanding of the medicines used in antiquity and the Middle Ages. Claudius Galenus, commonly known as Galen, is the fitting closure of Hellenistic medicine and the start of Imperial medicine. He is the most important and the most influential of the ancient Greek physicians, whose enormous mass of surviving treatises have had an extensive influence, for more than fourteen centuries, on the different branches of medical science. Few if any others, before or after, have had such an impact. He was born (around 129 CE) at Pergamum, into a wealthy family and studied medicine there. At the age of twenty, he travelled to the major medical centers such as Smyrna and Corinth to improve his practical acquaintance with human anatomy, but still in a limited way, i.e. only the skeleton. Then he went to Alexandria where he absorbed all he could from the fading schools of the once splendid metropolis7. At the age of twenty eight (c. 157 CE), he returned from Alexandria to Pergamum, where he became the surgeon at the School of Gladiators. In 162 CE he left for Rome where he acquired a reputation as a skilled practitioner, physician, lecturer and writer. He was to leave Rome for a brief while but returned in in 169 CE at the invitation of the Emperor Marcus Aurelius who wanted his services. He would be physician to the Emperors Marcus Aurelius (161–180 CE), Commodus (180–192 CE), Septimus Severus (193–212 CE). 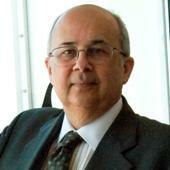 But he did not abandon his research and over the next two decades he would write and edit his many books. The date and place of his death is uncertain. While some say that he spent his last days at Pergamum in 199 CE Suidas says that Galen died at the age of seventy (i.e. c. 201 CE); however, Arabic biographers propose that he died in Sicily at age of 88 (i.e. 219 CE). (Figures 4 and 5). The works of Galen alone form about half of the mass of the surviving Ancient Greek medical writings. He wrote no less than five hundred treatises, out of which eighty three are extant and acknowledged to be genuine, covering not only every aspect of medicine, but also ethics, philosophy, logic, and grammar. Many of Galen’s works reached the West, during the early Middle Ages, thanks to the Syriac and Arabic translations of Hunain ibn Ishaq and Hubaish ibn al-Hassan. His principal treatise is ‘On Anatomical Procedures’ in fifteen books, the last six of which —as well as about two thirds of the ninth— are now extant only in Arabic translation. With the death of Galen, a brilliant chapter of the history of medical science comes to a close. The impetus he provided would carry on in the declining Roman Empire for several centuries. But Rome was waning, and the Dark Ages were setting in. For the best part of the next thousand years, it would be the Arabs and Muslims who would carry the torch of science and learning as Europe would remain in the grip of the Dark Ages. Then with the Renaissance and the scientific revolution of the 16th and 17th centuries, the torch would pass once more to Europe. And it was in the West that the great journey of medicine would continue, a journey started so long ago by Imhotep who said that disease was not due to magic but rather a natural, physical process that could be studied and treated. A journey, where so much of the creative work in Greece, Alexandria and Rome would carry humanity forward a long distance, and constitute an incredible body of work, parts of which are still of relevance today. 1600 years after the disappearance of the Library of Alexandria in 391 CE and the murder of Hypatia in 415 CE, the Library of Alexandria was reborn largely on the same spot where it was born some 23 centuries earlier. It was a bold imaginative idea, to recapture the spirit of the ancient library with the tools of the new millennium, a dream that seemed for many to be beyond attainment, but the dream was realized in a few short years. Today, the library stands as a beautiful building that is like a large disk slanting towards the Mediterranean. Whether the disc is an echo of the sun disc, so important for ancient Egyptians, or the rising sun of knowledge slanted towards the endless sea with its unbounded horizons is better left to the imagination of visitors and viewers. The library is a vast enterprise that relinks with its past in many fields, including medicine, although much more modestly at present than what once was and could be again (Figure 6). The Library is a hive of active institutions: Planetarium, Exploratorium, conference center, 19 museums and permanent art exhibits, four art galleries with changing exhibitions, advanced informatics, seven specialized libraries, the large library, a super computer and 15 research institutes, including a small research laboratory that connects researchers on the genetics of HCM in Egypt and Europe under the watchful eye of a modern day leader of medicine, Sir Magdi Yacoub. But the library does not house a formal school of medicine today, and perhaps it does not need to. Today, great scientists fly in for a seminar and leave, they do not have to reside years after perilous and long journeys in small boats on the Mediterranean. Practitioners organize huge annual conferences to compare notes on their work and discuss the latest technologies and techniques. 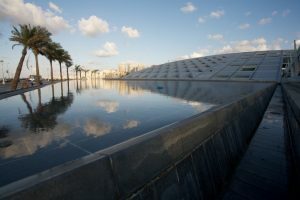 The new Library of Alexandria, which is host to many such activities in many fields, including a number in the field of medicine, is active in the promotion of knowledge and its dissemination, much as its ancient namesake did. It is on the pages of learned journals and in such meetings as those organized by the Bibliotheca Alexandrina (BA), the new Library of Alexandria, that the future – including the future of medicine – is being imagined as it gets crafted in the many cutting-edge laboratories around the world. And like its ancient namesake, the New Library of Alexandria stands for values that we hold dear: rationality, liberty of inquiry, freedom of expression, pluralism, dialogue, learning and understanding. Anchored in the past, active in the present, embracing the future, the modern contemporary BA is just beginning its journey of rediscovery and the best is yet to come. Women also enter our records early on, shortly after Imhotep: Merit Ptah in Egypt, sometimes called the first astronomer, and En Hedu Anna in Mesopotamia – daughter of Sargon of Akkad and priestess of the Moon God. In late 4th C BCE Athens the Physician Agnodice was put on trial for pretending to be a man to practice medicine, which was formally illegal. Her women patients (many of whom were wives of important men) saved her and had the law repealed. A modern translation (Wikipedia, accessed 18 10 2013) would read as follows: I swear by Apollo, the healer, Asclepius, Hygieia, and Panacea, and I take to witness all the gods, all the goddesses, to keep according to my ability and my judgment, the following Oath and agreement: To consider dear to me, as my parents, him who taught me this art; to live in common with him and, if necessary, to share my goods with him; To look upon his children as my own brothers, to teach them this art; and that by my teaching, I will impart a knowledge of this art to my own sons, and to my teacher’s sons, and to disciples bound by an indenture and oath according to the medical laws, and no others. I will prescribe regimens for the good of my patients according to my ability and my judgment and never do harm to anyone. I will give no deadly medicine to any one if asked, nor suggest any such counsel; and similarly I will not give a woman a pessary to cause an abortion. But I will preserve the purity of my life and my arts. I will not cut for stone, even for patients in whom the disease is manifest; I will leave this operation to be performed by practitioners, specialists in this art. In every house where I come I will enter only for the good of my patients, keeping myself far from all intentional ill-doing and all seduction and especially from the pleasures of love with women or men, be they free or slaves. All that may come to my knowledge in the exercise of my profession or in daily commerce with men, which ought not to be spread abroad, I will keep secret and will never reveal. If I keep this oath faithfully, may I enjoy my life and practice my art, respected by all humanity and in all times; but if I swerve from it or violate it, may the reverse be my life. Hippocrates assumed that an excess or deficiency of any of four distinct bodily fluids in a person directly influences their temperament and health. These four fluids are black bile, yellow bile, phlegm, and blood. Each was posited to correspond to one of the traditional four temperaments: melancholic (analytical and thoughtful), choleric (ambitious and leader-like), phlegmatic (relaxed and quiet), and sanguine (pleasure-seeking and sociable). From Hippocrates onward, this theory was adopted by Greek, Roman and Persian physicians. It became the most commonly held view of the human body among European physicians until the advent of modern medical research in the nineteenth century. Claudius Galenus better known as Galen of Pergamum was the most accomplished of all medical practitioners of antiquity. He would be the personal physician of two emperors, and contributed greatly to the understanding of anatomy, physiology, pathology, pharmacology, and neurology, as well as philosophy and logic. In Greek mythology, the Pierian Spring of Macedonia was sacred to the Muses. As the metaphorical source of knowledge of art and science, it was popularized by a couplet in Alexander Pope’s poem “An Essay on Criticism” (1709): “A little learning is a dang’rous thing;/Drink deep, or taste not the Pierian spring.” (see Wikipedia at http://en.wikipedia.org/wiki/Pierian_Spring)—since the Ancient Library was founded as the temple to the muses, and by Alexander the great, originally from Macedonia, it is an apposite reference here. Galen absorbed and then added to the body of knowledge of his time. For example, although Herophilus and Erasistratus were the first to state the importance of the ventricles, it is Galen who creates a detailed anatomical and physiological description of the brain, the cranial nerves and the spinal cord. Brill’s New Pauly: Encyclopaedia of the Ancient World. Edited by Hubert Cancik and Helmuth Schneider. Leiden: Brill, 2002. The Cambridge Ancient History. 3rd ed. Cambridge: Cambridge University Press, 1970. Der Kleine Pauly: Lexikon der Antike. Edited by Konrat Ziegler and Walther Sontheimer. 5 vols. München: Deutscher Taschenbuch, 1979. The Oxford Classical Dictionary. Edited by Simon Hornblower and Antony Spawforth. 4th ed. Oxford: Oxford University Press, 2007. Real-Encyclopädie der classischen altertumswissenschaft. Edited by A. Pauly, G. Wissowa, and W. Kroll. Stuttgart: Verlag J.B. Metzler, 1962. Gillispie, Charles Coulston, ed. Dictionary of Scientific Biography. New York: Charles Scribner’s Sons, 1981. Peremans, Willy, and E. van’t Dack. Prosopographia ptolemaica. Studia Hellenistica 20–21, 25, 38. Lovanii: Studia Hellenistica, 1977. Clagett, Marshall. Greek Science in Antiquity. Mineola, NY: Dover, 2001. Cumston, C.G. The History of Medicine: From the Time of the Pharaohs to the End of the XVIIIth Century. London: Routledge, 1998. Fraser, P.M. Ptolemaic Alexandria. 3 vols. Oxford: Clarendon Press, 2001. Gill, Christopher, Tim Whitmarsh, and John Wilkins, eds. Galen and the World of Knowledge. Cambridge: Cambridge University Press, 2009. Glanville, S.R.K., ed. The Legacy of Egypt. Oxford: Clarendon Press, 1957. Hirt Raj, Marguerite. Médecins et malades de l’Égypte Romaine: Étude socio-légale de la profession médicale et de ses praticiens du Ier au IVe sie`cle ap. J.-C. Leiden: Brill, 2006. Hurry, Jamieson. Imhotep: The Vizier and Physician of King Zoser and afterwards the Egyptian God of Medicine. 2nd and rev. ed. London: Oxford University Press, 1928. Irby-Massie, Georgia L. Greek Science of the Hellenistic Era: A Sourcebook. London: Routledge, 2002. Jouanna, Jacques. 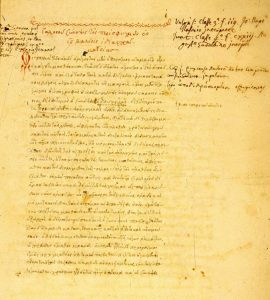 Greek Medicine From Hippocrates to Galen: Selected Papers. Leiden: Brill, 2012. Longrigg, James. Greek Medicine: From the Heroic to the Hellenistic Age: A Source Book. New York: Routledge, 1998. Magner, Lois N. A History of Medicine. 2nd ed. Boca Raton: Taylor and Francis, 2005. Nutton, Vivian. Ancient Medicine. London: Routledge, 2004. Rey, Abel. La Science dans l’antiquité: La science orientale avant les grecs. L’évolution de l’humanité; synthsèse collective. Paris: la Renaissance du Livre, 1930. _____. Introduction to the History of Science. 3 vols. Huntington, NY: R.E. Krieger, 1975. Temkin, Owsei. Hippocrates in a World of Pagans and Christians. Baltimore: Johns Hopkins University Press, 1991. Tiner, John Hudson. Exploring the History of Medicine: From the Ancient Physicians of Pharaoh to Genetic Engineering. Green Forest, AR: Master Books, 1999. Van Der Eijk, Philip, ed. Ancient Histories of Medicine: Essays in Medical Doxography and Historiography in Classical Antiquity. Leiden: Brill, 1999. Zhmud, Leonid. The Origin of the History of Science in Classical Antiquity. Translated from Russian by Alexander Chernoglazov. Berlin: Walter De Gruyter, 2006. Originally published by Global Cardiology Science & Practice 4 (2013, 395-404), DOI: 10.5339/gcsp.2013.47, under the terms of a Creative Commons Attribution 3.0 Unported license. This entry was posted in Ancient, History, Medicine. Bookmark the permalink.